Would you like a concrete look kitchen? Micro concrete is an abrasion-resistant and waterproof finishing for you kitchen. We specialise in concrete look kitchens. Our micro concrete is especially composed for kitchens with MDF, synthetic, plaster, stone or tile surfaces. A concrete look kitchen worktop, back wall, or complete micro concrete kitchen is seamless and available in many colour tones. A concrete sink in any shape or colour imaginable is especially modern. Request a free concrete look kitchen quote. A concrete look kitchen is available in many colour tones, always has a unique texture and is entirely seamless. Concrete in the kitchen is elegant, modern and durable. The water-resistant, mould-resistant coating is very practical. 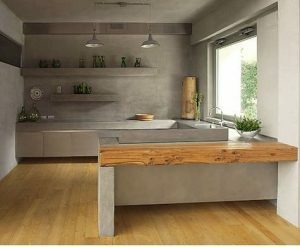 Beton DeLuxe is specialised in concrete look kitchen worktops, concrete look kitchen walls and concrete look kitchens. Send a WhatsApp message or text message for more info. A sleek kitchen with an industrial look and feel? A warm, natural, concrete look kitchen? A concrete look back wall or partition makes for an elegant look. The combination with a concrete worktop and/or concrete look floor is the finishing touch. Concrete in the kitchen is as robust as it looks. If you want it to look extra trendy, combine concrete with wooden elements. The price of a concrete look kitchen and the time it takes to make it are another advantage. Send us an email at contact@beton-deluxe.com or call our general information line +31 (0) 13 – 2112823.